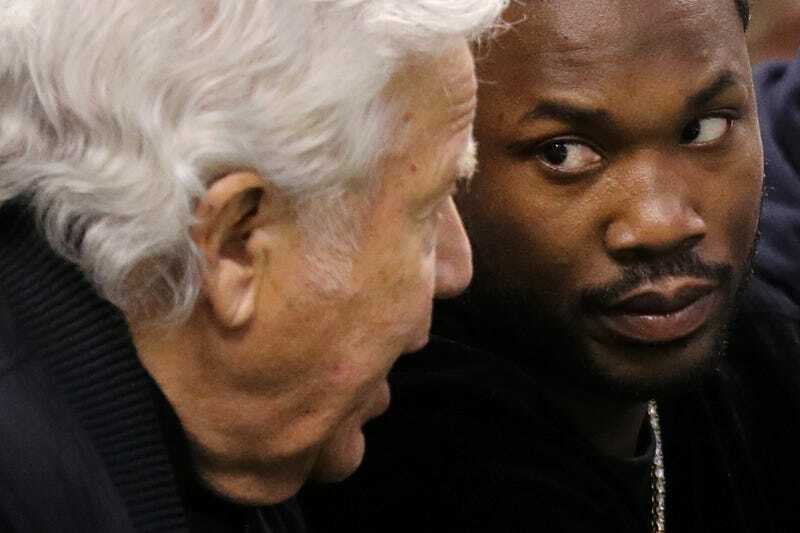 New England Patriots owner Robert Kraft talks with rapper Meek Mill talks during Game 2 of the Eastern Conference second round of the 2018 NBA playoffs between the Boston Celtics and the Philadelphia 76ers in Boston on May 3, 2018. Although Robert Rihmeek Williams is “free” to go to championship basketball games, kick it with friends and stunt on Instagram, he is still not free of the case that put him in the position he’s in in the first place. Larry Krasner, Philly’s new district attorney, is a criminal-justice-reform advocate. On Tuesday his office wrote a letter to the judge, seeking a new trial for Meek. There are righteous questions about the credibility of the testimony given by the arresting officer in the case, Reginald V. Graham. Krasner’s predecessor, Seth Williams, had Graham on a list of police officers to keep off the witness stand because they are suspected of offenses such as racial bias, brutality, abuse or lying in court. Meek’s conviction was based largely on Graham’s testimony that police informants had seen Meek selling crack cocaine. Because of Graham’s inclusion on that DA list, Meek’s attorneys have argued that his conviction should be overturned. On Wednesday, they were in court to request that Common Pleas Judge Genece Brinkley be removed from his case. They accuse her of having a vendetta against Meek. Brinkley denies those allegations, saying that she has acted “impartially and without prejudice” in all the proceedings related to Meek’s case. Common Pleas Judge Leon Tucker told Meek’s attorneys at Wednesday’s hearing that because he and Brinkley are judges in the same court, he did not have the jurisdiction to remove her; it is a matter for the Pennsylvania Supreme Court. Meek’s case is due back in court June 18. In the meantime, his attorneys plan to make their appeal to the state Supreme Court. It was the state Supreme Court that ordered Meek’s release on bail; Brinkley had previously denied his requests. The question, then, is why hasn’t Brinkley already been removed? If she still has power over Meek’s case, she still has power to abuse. His grasp on freedom at this point is tenuous at best. It can be snatched away at any moment by someone who seems determined to keep him shackled to a crime he’s outgrown and moved on from. Isn’t the entire point of the criminal-justice system to rehabilitate? At least, isn’t that what they say it is? If that’s the case, I would argue that Meek is rehabilitated. He’s built a career, and he’s on to other things. Sure, he has had some minor bumps on the way, but he’s largely avoided any major trouble—and that is the point. And even with all of that—all the years that have gone by since the original crime and all the progress he has made as an adult—he is still being tethered by a choke chain that threatens to snap his neck if he gets to feeling too free. That is the antithesis of freedom.